Alan added information about this “Laps for Literacy” event on the High Desert Runners’ Toeing the Mark page a couple of weeks ago. It has been a month or two since I have done a 5k, so I thought I would give it a try. I did not taper for it though, in fact yesterday I did two 5.5 mile runs for 11 miles total. Reading the info on the race I was really uncertain that it was really a race. They called it a walk/run. They put the word walk before the word run thus belying their emphasis. But it was free, and it was something I could invite my daughter and grandchildren to so I figured come what may, I would check it out. We arrived and donated a children’s book and signed a waiver and waited to see what would happen. Erik and Krysti were there along with Oscar and Dora. A couple of my students were there as well. We asked where the run started and they said in the stadium. We waited and they announced for us to get ready on the dirt track. We figured that the “run” was going to literally be “laps” for literacy. They said go and everyone headed off counterclockwise around the field. Not knowing which way we were going, we had lined up near the wrong end of the crowd, so we had to start by weaving our way through and around all the walkers. Out of the 100 or so participants, 80% were walkers. I had come for a 5k, though, so I took off comfortably hard. 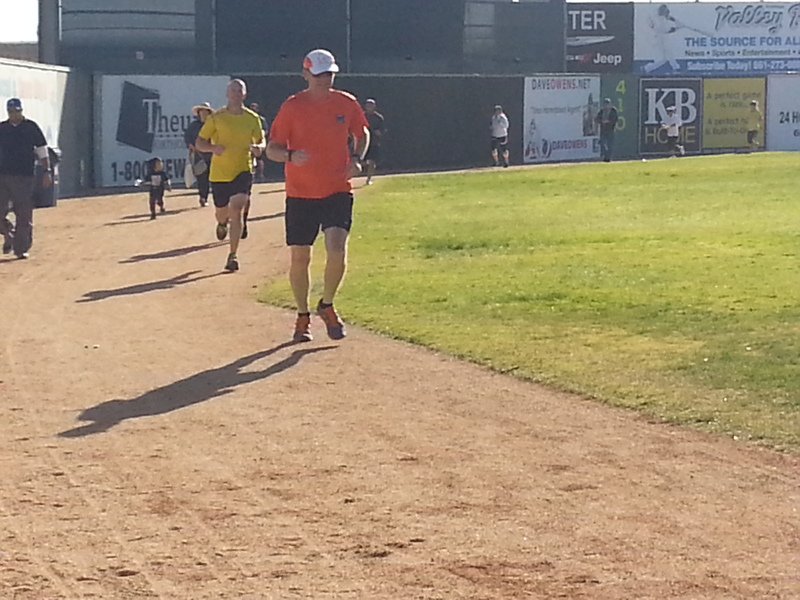 After a few laps, Erik caught me and we ran together for awhile. Mostly, I ran right behind him. In the 3rd mile he pulled 50 meters ahead. At 3.1 miles I stopped. My shoe was untied, so I tied it. Then I continued at a very easy recovery pace until I had completed 4 miles. Erik, Oscar, Krysti and Dora stopped a lap or two before I did. So, when I finished my 4th mile I ran up to Erik and announced that I was declaring the event a 4 mile race for Grand Prix purposes, and that I had just won!! Of course, I was just kidding. According to Garmin, I ran a pretty good race! My miles were 7:01, 6:24 and 6:55. My 5k time was 21 minutes flat! That would be my best 5k in a year and a half! Of course, other than dodging walkers the running conditions were ideal. The dirt track had excellent footing and their were only 2 hills on each lap. Well, more like speed bumps…… pitching mounds…. When my daughter sends pictures I will add them! Hey, look who is ahead of Erik! !